I am always trying to figure out fast, easy, and healthy recipes. This one is great, so I thought that I would share it. 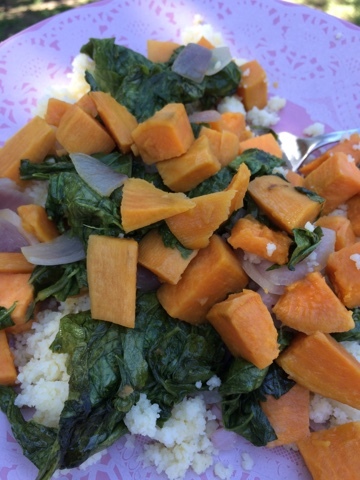 Sweet Potatoes, collard greens, and red onions work really well together. You can substitute any green, such as kale or spinach. Eat this alone, or with a grain of your choice. This time, I made it with couscous. Add your water or broth to a small sauce pan, and bring to a boil. Pour the couscous into the boiling liquid. Turn down to low, cover and let simmer for five minutes. Remove from heat, fluff with a fork, and set aside. Peel the potatoes, and cut into cubes. 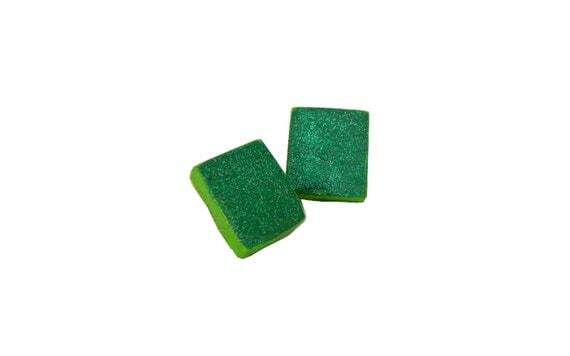 Wash and tear the greens into 1 - 2 inch pieces. Chop up the onion. Heat the oil up in a large skillet or dutch oven over medium heat. Add the potatoes and onions. Cover and let them cook for a few minutes, then turn them and cook about a min longer. Cover and cook until they start to wilt. Turn everything again, and cook a bit longer with the cover off. Depending on how much time I have, I will add different herbs and spices. This is very versatile, low sodium, and vegan. Let me know how it works out for you. What different variations can you think to try? It's officially Spring!! 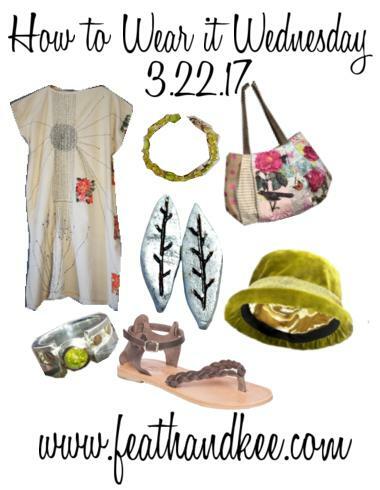 It feels like Summer here in Texas, so of course, I have breezy, comfortable outfits on my mind. 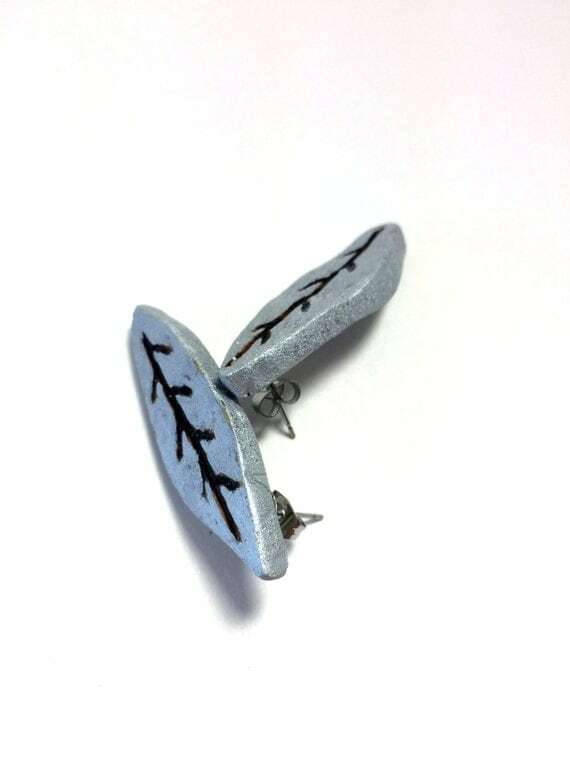 After cutting out the leaf shapes, sanding, then burning the leaf veins into the wood for this pair of earrings, I finished them off with a silver metallic paint. They are currently available online at our shop, and at 101 E. Main St., Olney, Texas. Everyone needs a magic bag. I love this one from JenJohn Handbags. 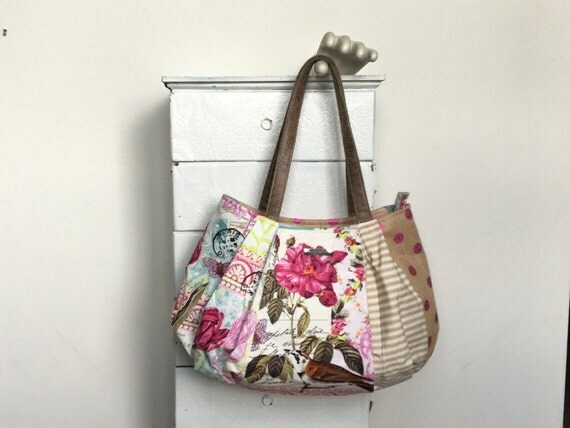 Each bag is made to order with tons of compartments. You can choose a button or zip closure, and the length of vegan leather straps. 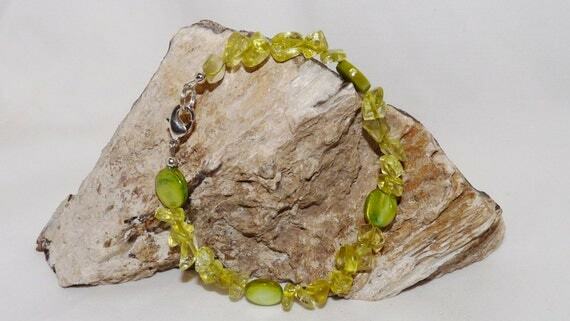 The Peridot gemstones on this bracelet from Tillies Treasure just sparkle! You really never know where life is going to take you. Many years ago, cotton fabric was made into a table cloth. It was forgotten, passed on, then discovered by Tina at RebirthRecycling. 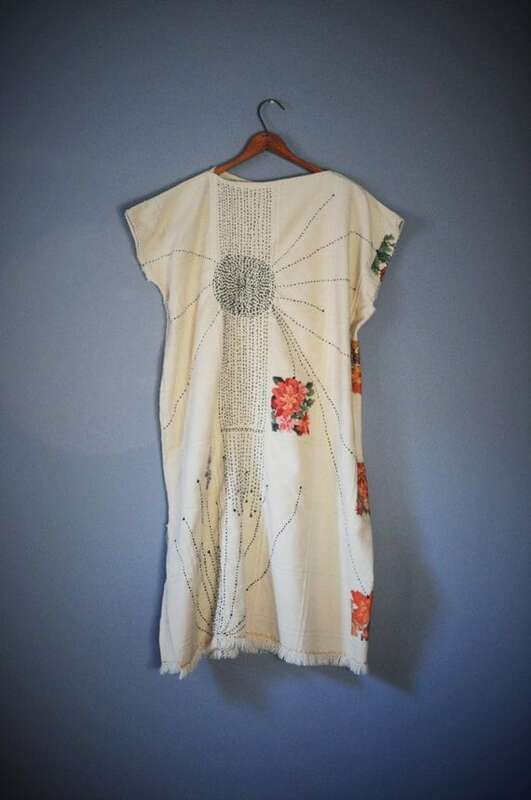 She painstakingly added Japanese Boro embroidery and turned the simple table cloth into this elegant tunic dress. 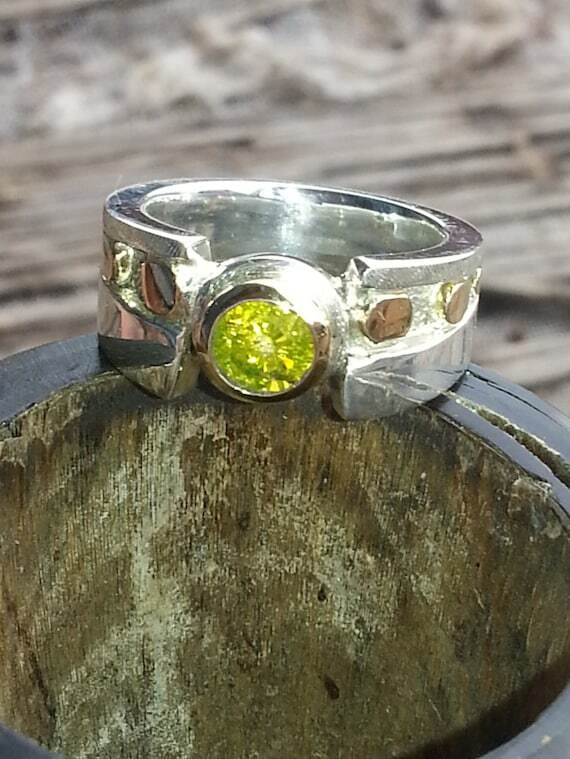 This ring from The Twist On Jewelry is made to order. The pictured ring is made from sterling silver, 18k gold dots, and a .80 k diamond set in an 18k yellow gold bezel. 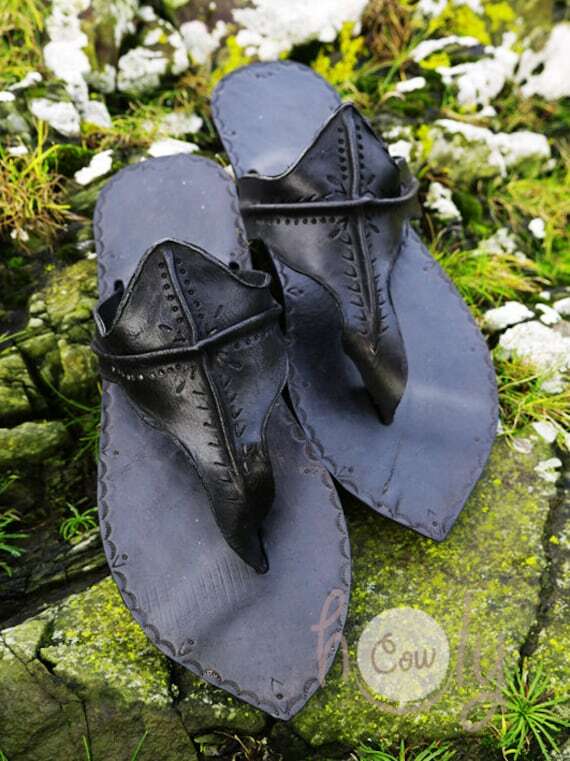 After handcrafting leather sandals in Greece for three generations, Floga brought their creations to the United States, opening Floga New York. 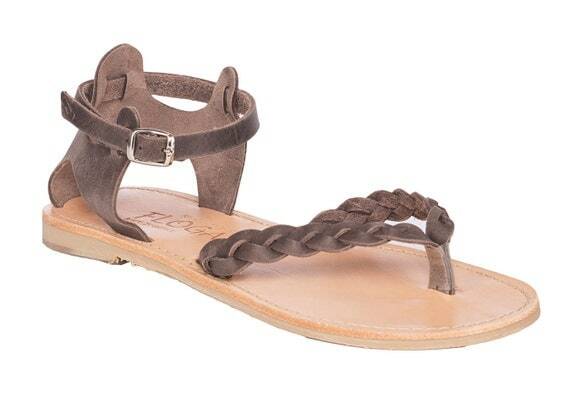 This sandal features an adjustable ankle strap. 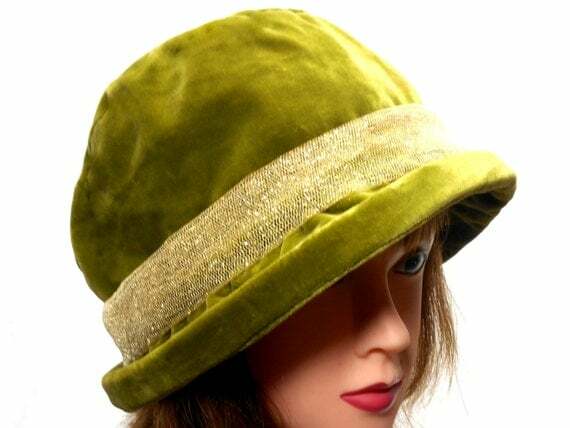 Made from vintage velveteen, in just the right shade of green, this lovely bowler hat from Corona Hats also has a sparkly gold hatband. With St. Patrick's Day this Friday, I decided to feature Irish designers and makers this week. Everything except our earrings is from Ireland. 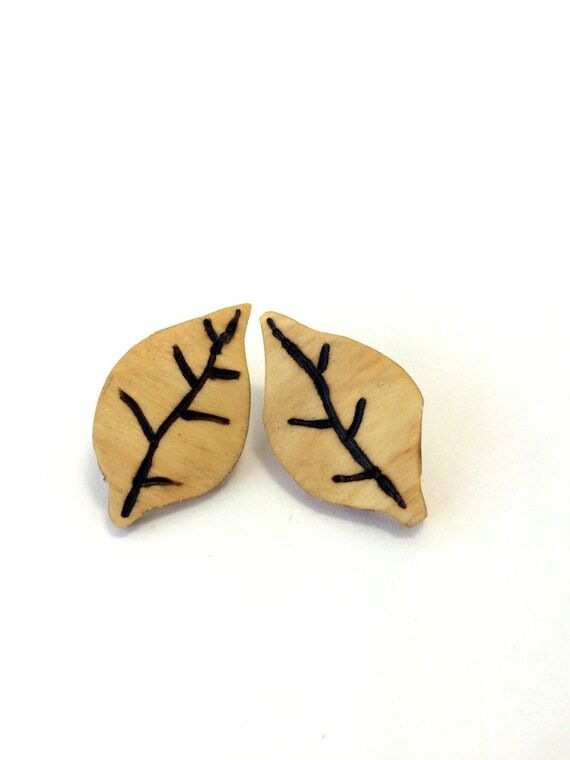 Reclaimed Birch Leaf Earrings from our shop. Holy Cow Products makes each of their made to order shoes by hand. 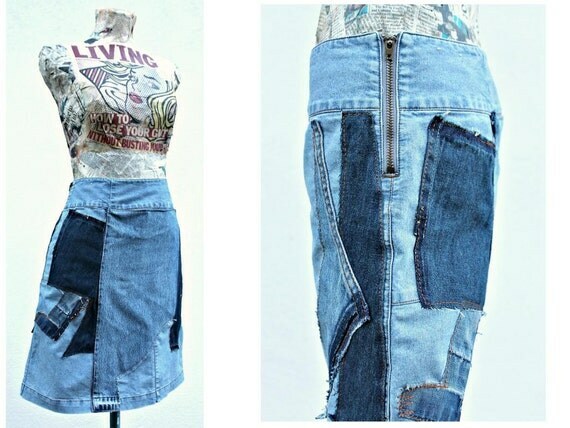 This patchwork denim skirt from LovedAgain4you was made from reclaimed denim. 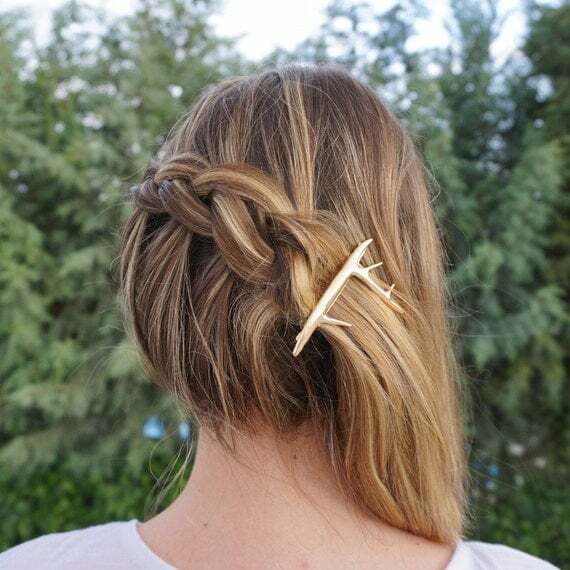 You can find this gold antler hair clip at Designs by GRG. 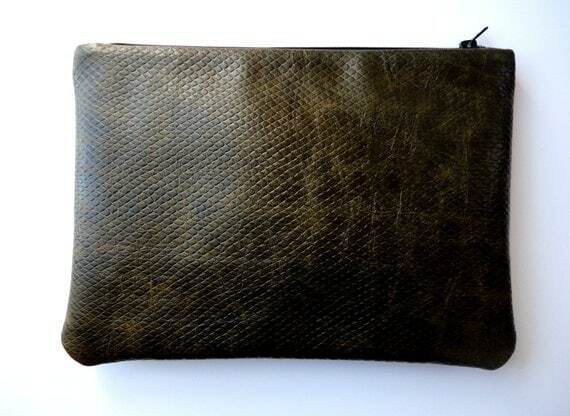 This clutch from Elina Grosa was made from vegan leather. 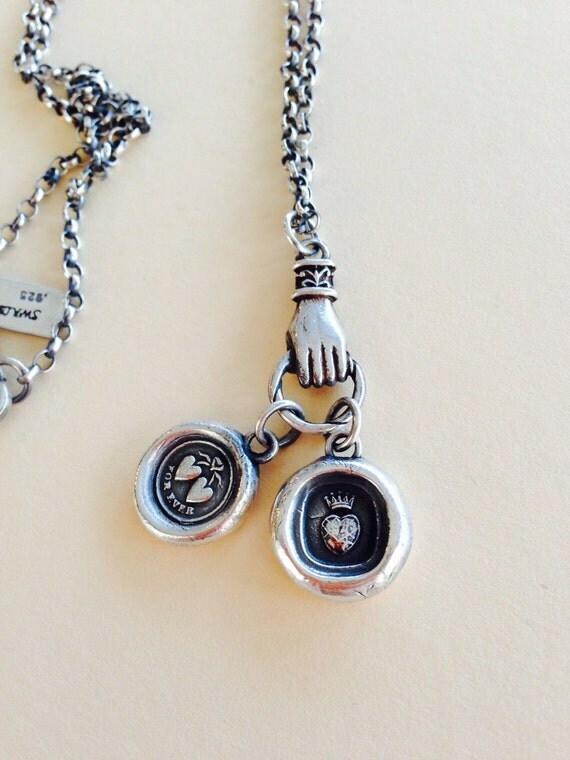 This limited edition necklace from SWALK features two amulets that were made from antique seal impressions. 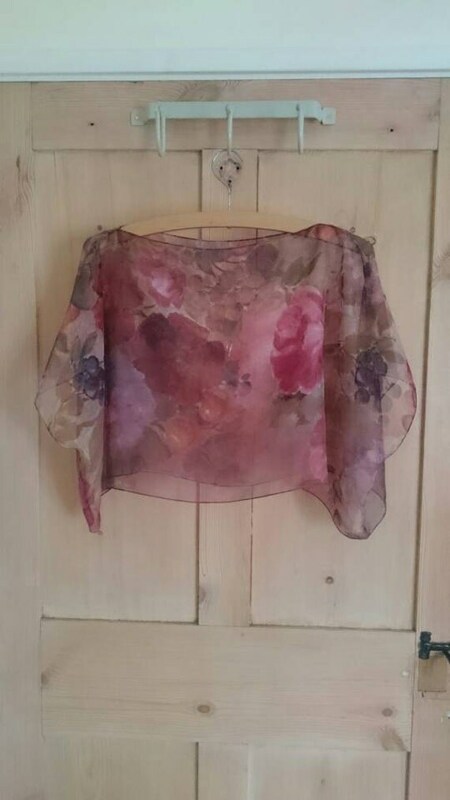 This lovely, kimono top from Alice Halliday was made from reclaimed chiffon. St. Patrick's Day is almost here! 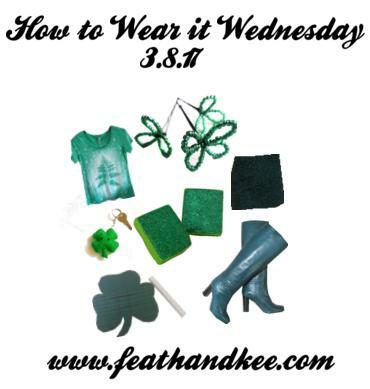 So we have a green outfit this week. 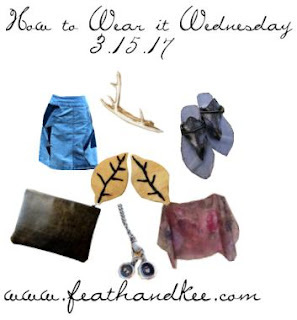 Every item except for the boots are from TEMPT Team members on Etsy. Today is also International Women's Day. 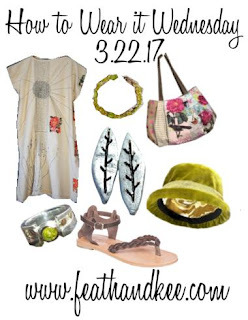 All of the featured items today come from small businesses that are owned or co-owned by women. These earrings from our shop have been painted lime and emerald green. 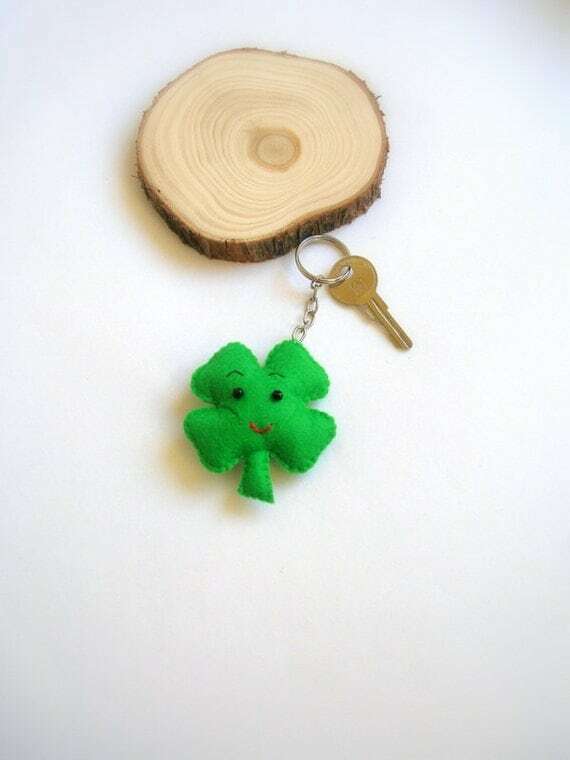 This cute clover key chain is made of felt, and can be found at Lilamina. 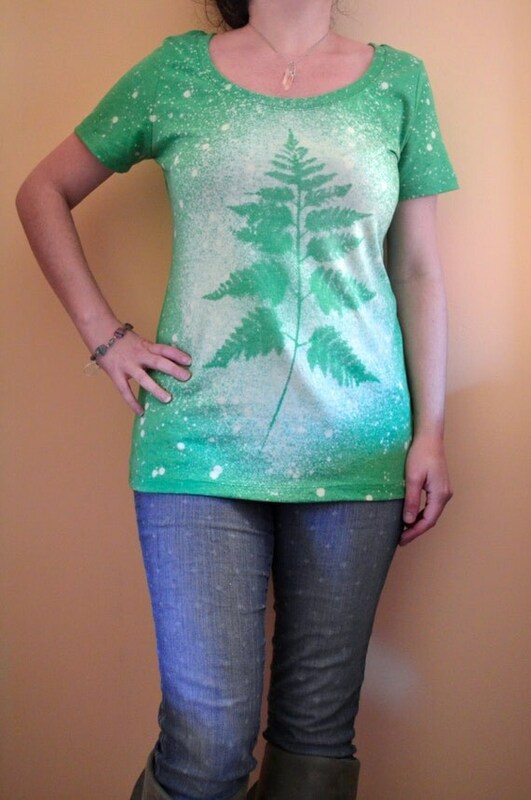 The Fern Shirt from Michelebuttons has been dyed by hand. Poodle Shirt from Cloud Hunter Co. This cool skirt from Cloud Hunter Co. has been made from faux poodle fur. 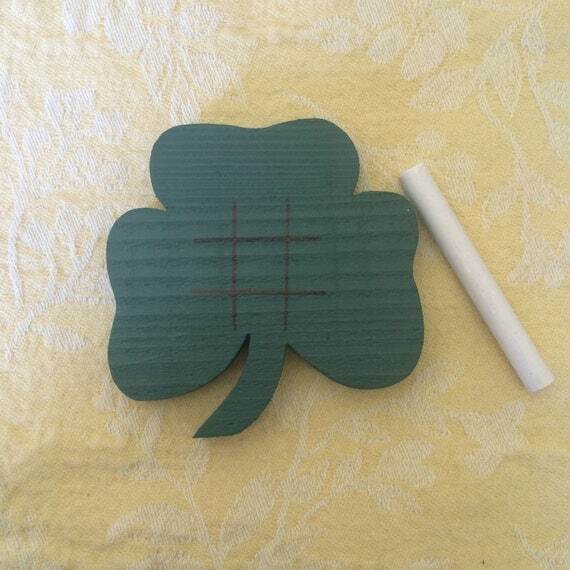 This Shamrock game board from Dust Witch Creations was made from reclaimed Cedar. 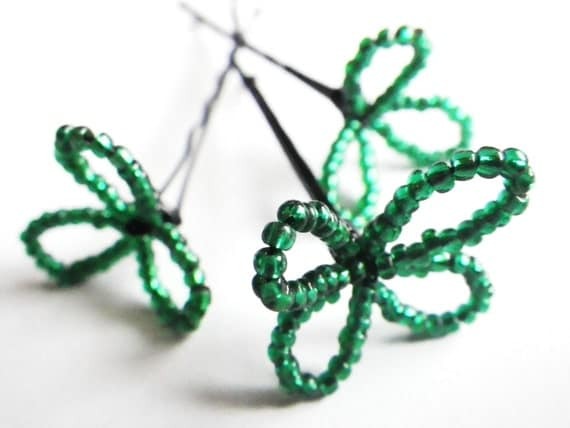 Green glass seed beads make up these lucky clover hair pins from CassieVision. You can request different variations of these boots from MonSoulier.